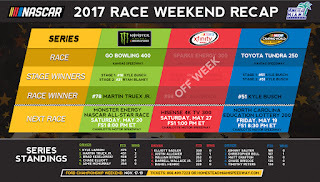 · Martin Truex Jr. won the 7th annual Go Bowling 400 Monster Energy NASCAR Cup Series race at Kansas Speedway Saturday night, his ninth victory in 416 career Monster Energy NASCAR Cup Series races. Of the nine, seven have come in the last three years (2015-17), including two this year. It is his seventh top-10 finish and third top-5 in 11 races this year. · Truex joins Brad Keselowski (2) and Jimmie Johnson (2) as the only multiple winners this year. 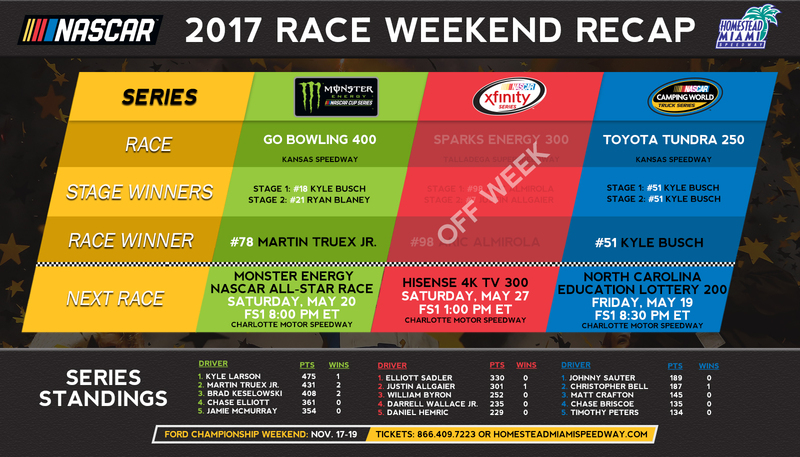 · It is Truex’s first win in 18 races at Kansas Speedway, where he has had six top-10 finishes. · Brad Keselowski (second) posted his ninth top-10 finish in 11 races this year. It is his eighth top-10 showing in 15 career Monster Energy Series starts at Kansas Speedway. · Kevin Harvick (third) posted his sixth top-10 finish in 11 races this year, tying his best showing of the year (at Bristol, 4/24). It is his 12th top-10 finish in 23 career Monster Energy Series Races at Kansas Speedway. · Daniel Suarez (7th) was the highest finishing rookie Saturday. His seventh-place showing ties for his best finish of the year, along with those at Phoenix (3/19) and at Auto Club (3/26). · Kyle Busch won Stage 1 of Saturday’s race while Ryan Blaney captured Stage 2. · Kyle Larson (475) leads the point standings by 44 points over Martin Truex Jr. (431). They are followed by Brad Keselowski (408). · Seven drivers currently have qualified for the 16-driver field of the 2017 Monster Energy NASCAR Cup Series Playoffs. The list consists of Kurt Busch, Brad Keselowski, Martin Truex Jr., Ryan Newman, Kyle Larson, Jimmie Johnson and Ricky Stenhouse Jr., each of whom has won at least one race this season. The Playoffs culminate with the Ford EcoBoost 400 championship finale on November 19 at Homestead-Miami Speedway. · Truex has made 12 career Monster Energy NASCAR Cup Series starts at Homestead-Miami Speedway and has amassed seven top-10 finishes, including a high of second in 2006. He was part of the Championship 4 in the Ford EcoBoost 400 at Homestead-Miami Speedway in 2015, finishing 12th in the race. He also celebrated a pair of XFINITY Series championships at Homestead-Miami Speedway, in 2004 and 2005. · Kyle Busch won the 17th annual Toyota Tundra 250 NASCAR Camping World Truck Series race at Kansas Speedway on Friday night. It is Busch’s 47th victory in 135 career NASCAR Camping World Truck Series races, and his first this year. · It is his second victory and third top-10 finish in four career Truck Series races at Kansas Speedway. Busch also won both Stage 1 and Stage 2 of Friday’s race. · Johnny Sauter (second) accounted for his sixth top-10 finish in nine Truck Series races at Kansas Speedway. It is his third top-10 finish in four races this year, all of which have been in the top-3, including a pair of second-place finishes. · John Hunter Nemechek (third) posted his first top-10 finish in two Truck Series races at Kansas Speedway. It is his second top-5 showing in four races this year and his highest finish. · Chase Briscoe (fifth) was the highest finishing rookie. · With one win apiece this year, rookie Kaz Grala and Christopher Bell have qualified for the 8-driver playoff field in the 2017 NASCAR Camping World Truck Series Playoffs. The Playoffs culminate with the Ford EcoBoost 200 Camping World Truck Series championship race at Homestead-Miami Speedway on Friday, November 17. · Johnny Sauter (189) leads the points standings by two points over Christopher Bell (187). · The NASCAR XFINITY Series was off this weekend. They will resume action on Saturday, May 27 with the Hisense 4K TV 300 at Charlotte Motor Speedway.